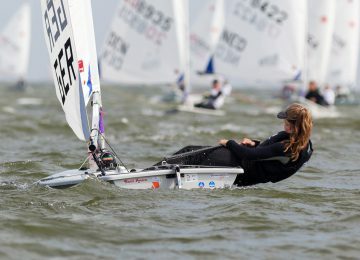 Fourth day of competition in Medemblik, Netherlands, where three new races were added to 2017 Radial Youth World Championships. Sunny skies and warm temperatures welcomed sailors today after rain and lack of wind suffered yesterday. 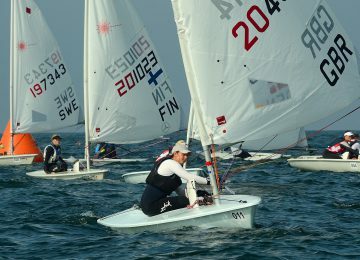 European sailors have consolidated their leadership in both Men and Women’s fleets. Julia Buesselberg GER (4-1-1-2-1-9-7) continues to lead girl’s championship with 16 points, closely followed now just by her fellow Hannah Anderssohn GER (3-11-4-3-2-1-4) with 17. 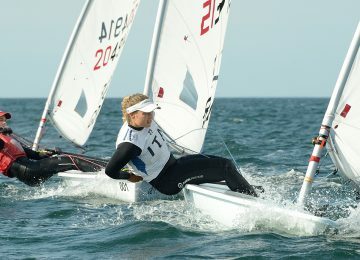 Third place overall for Dolores Moreira URU (5-12-2-4-5-3-1) with 20. U17 category leader Matilda Nicholls GBR (9-1-2-4-19-1-9) is now fourth overall, draw in 26 points with Lin Pletikos SLO (1-2-1-6-10-18-6). 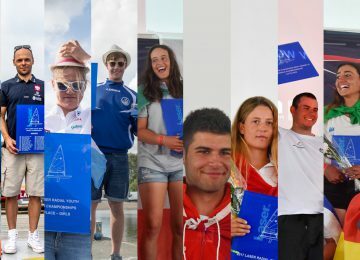 Dutch sailors Laila Van Der Meer NED (13-6-13-1-4-3-4) and Emma Savelon NED (2-8-54BFD-9-14-2-3) are 6th and 7th with 31 and 38 points respectively. Théa Khelif FRA (8-7-10-8-13-6-8) is also part of provisional Top 10 rank in 9th position with 47 units. Italian sailor Guido Gallinaro ITA (14-1-1-1-1-1-1) continues to rock in Medemblik, winning all three races today and comfortably leading Men’s World Championship with 6 points, followed by Matias Dietrich ARG (1-3-3-6-5-4-24) with 22. Swiss sailor Gregoire Peverelli SUI (12-5-2-1-2-13-1) has climbed now to provisional podium in 3rd with 23 points. Fourth place overall for Maor Ben Harosh ISR (2-3-3-30-8-5-8) with 29. Jimmy Marchand FRA, Daniil Krutskikh RUS, Uffe Tomasgaard NOR and Alexandre Boite FRA are also within Top 10, in places 6th to 9th respectively. 5th place overall is held by U17 leader Josh Armit NZL with 34 units. 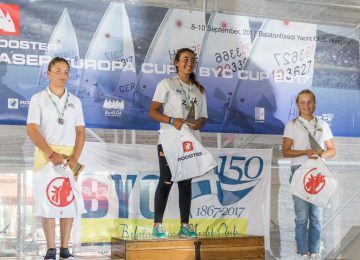 2017 Laser Radial Youth World Championships – Full results here. By Agustín Argüelles – EurILCA | Photo: Thom Touw.